In interior design the question is often asked, “What style exemplifies luxury and first-class amenities in a residential or commercial space?” A modern staircase is sure to make a statement and do just that. With several modern styles to choose from you can rest assured there is a perfect staircase that will meet all of your personal preference and design needs. To begin exploring these modern choices, let’s take a look at three of our most popular designs you will want to take into consideration as an accent in your home or commercial building, from inspiration to installation. 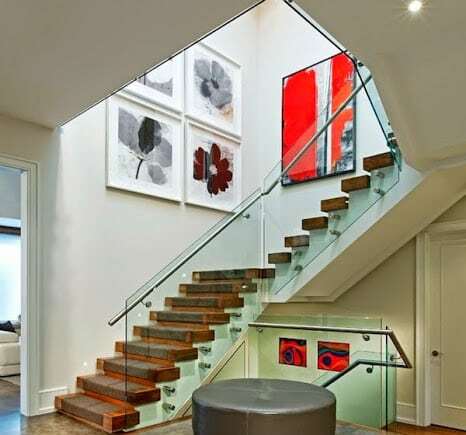 Looking at this staircase it takes only a moment to recognize its elegance and modern flare. Featuring maple open rise treads on the u-shaped straight staircase, it is a great example of an appealing, classy option in contemporary design. The contrast created between the wooden treads set against a white backdrop of muted color adds a truly modern vibe to the home, while the clean lines of the cable railing system enhance the residential interior with radiating charm. It exhibits a cultivating chic and open environment, allowing light to pass through the home. This multi-level, residential staircase attaches to the wall and features a u-shaped stair design, offering a custom fit. With wooden treads, the look and appeal of the staircase is sure to meet all of your modern staircase preferences. Accompanied by the glass and stainless steel railing, the glass boasts a sleek finished look. This modern stair design is the perfect combination of durability and strength, while retaining simplicity guaranteed to make a statement. Creating a small footprint in the foyer this modern staircase is optimally placed for minimum distraction. 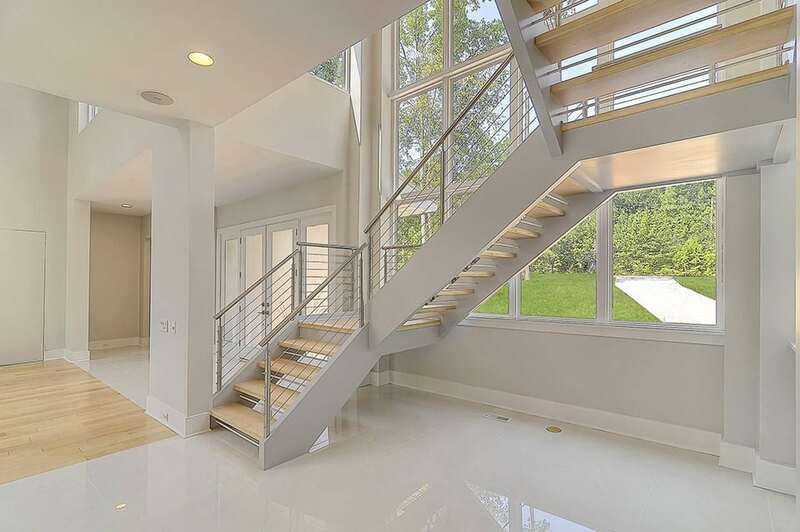 An ultra-contemporary design custom manufactured for this residence, the curved staircase and balcony features stainless steel newel posts and 1/2″ horizontal bar stainless tubing. The sleek Monaco handrail in red oak delivers an aesthetic quality to the overall look of the stair with simple accents, while the stainless steel bars maximize visibility to admire additional aspects of the space. An open balcony on the second level overlooking the foyer and living area establishes an airy feeling continued throughout the home. 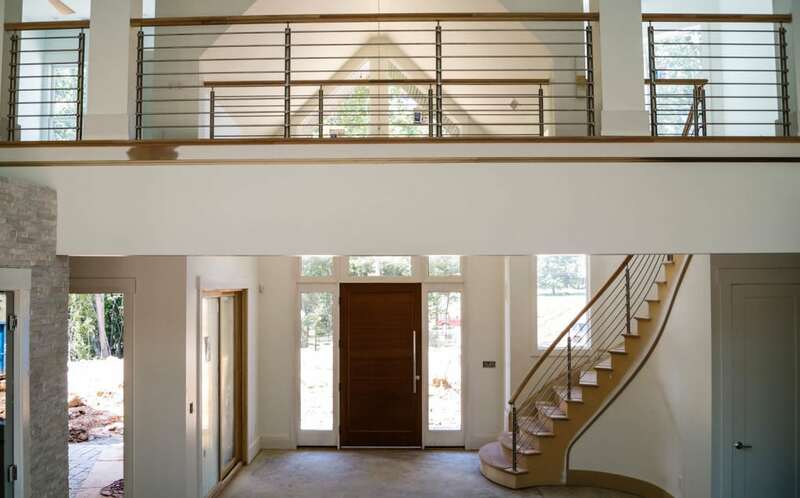 Visit our modern railing design project gallery for additional details and pictures of our exquisite projects. From inspiration to installation our team is committed to designing and building the highest quality custom staircases. Our reputation speaks for itself and client satisfaction is our highest priority. Contact us today to discuss your next custom stairs project. With all the modern choices in interior design, we could not possibly stop at showcasing only three modern staircase designs. In fact, we are just getting started. Stay tuned next week for our upcoming blog on three additional modern stairs you will simply love!